I'll be the first person you see as you enter the Alumni House, and I'll always be there with a smile to welcome you! I assist with many aspects of our busy office including connecting alumni and coordinating many aspects of alumni events, like the Wine Festival. You can contact me with any question. If I don't have the answer, I can find someone who does! 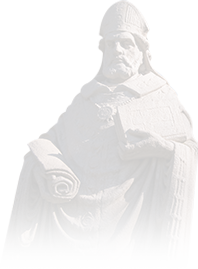 My connection to St. Ambrose: I started my career at St. Ambrose in July 2010, and I knew right away it was a great fit. My son and daughter are current students and will soon become graduates of SAU which is very exciting! What I like about my job: Talking with alumni and hearing their stories, especially those returning for their 50th reunion during Homecoming. I also enjoy connecting alumni of all ages with old friends. My favorite event is actually three events. I love the excitement and planning that goes into the Wine Festival events (Wine at the Warehouse, Preview Dinner, and the Wine Festival). Just knowing we are raising money for student scholarships is a bonus! Most commonly asked question: How do you like working at SAU? My answer is always the same: It's a wonderful place to work, and I enjoy the feeling of "family" at the university. This is especially true in the Alumni House, and I am thankful to work with such great people on a daily basis. "I'll be the first person you see as you enter the Alumni House, and I'll always be there with a smile to welcome you!"